"She defiled the image I had created of her—and so, I killed her." This disc is the second in a series devoted to the films of Edgar G. Ulmer, best known as the director of the 1934 Boris Karloff/Bela Lugosi vehicle, The Black Cat. John Carradine stars as the mad Gaston, the Bluebeard of the title, a late 19th century Parisian puppeteer and artist who feels compelled to murder his models and dump their bodies in the Seine. The identity of the killer is given almost immediately, so there is no spoiler here. The suspense comes from the simultaneous questions: Will the heroine, Lucille, fall into the murderer's clutches, or will the police, stymied by a lack of clues, catch him before he kills again? Carradine gives one of the most restrained performances here that I've ever seen from him. Notoriously prone to hammy overacting, Carradine instead plays Gaston as a complex character driven by his obsessions, but who also feels guilt and wants to avoid killing. Unfortunately the rest of the supporting cast does not measure up to Carradine's performance: nearly all of the other characters are bland and undistinguished. Annoyingly, the accents are all over the map, from heavy stage French to the broad Midwestern twang heard from some of the "Parisian" artists' models. The production is quite stylish and almost seems like a film noir; many scenes are steeped in deep shadows. 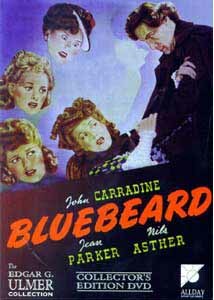 Ulmer had a unique vision that unfortunately was stuck in extremely low budget grade B films for Poverty Row studios such as PRC, which originally produced Bluebeard. The film had become somewhat of an obsession for Ulmer himself; he had originally wanted to film it as early as 1935, with Karloff in the lead role (the publicity materials on the disc even include a poster with Karloff as Gaston). When he finally was able to make the film in 1944, Ulmer put many personal idiosyncrasies into it, such as his love of opera and puppeteering, united in the extended presentation of a scene from the opera Faust as enacted by Gaston's marionettes. This opera effectively prefigures the Faustian bargain whereby Gaston is able to practice his art only if he kills his models. Ulmer's genius lay in making effective and individualistic films on practically no budget. A good example is the climactic rooftop chase scene. Although his roof sets are almost pathetically barren, Ulmer turns this defect into an asset, turning the sets at crazy angles to make an almost Expressionist statement, not dissimilar to the chase scene in Cabinet of Dr. Caligari (1919).The music for the film is almost entirely made up of various episodes of Mussorgsky's Pictures at an Exhibition, cleverly modified. Usually, classical music that is imported into a film sticks out as inappropriate; however this score wisely selects only the moods of Mussorgsky's suite which exactly fit the action. The marriage of the music to this film is seamless and is a tremendously effective counterpoint to the screen. Image Transfer Review: All Day has used a restored archival print for this disc. By and large, the black and white image quality is excellent for a picture of this age—especially one from a third-rate studio that was probably not high on any preservationists' lists. Some light speckling is visible on the main titles and near the reel changes, but this is probably as good as this film is ever likely to look; considering the studio involved, I'd guess that it's better than the release prints looked in 1944. Blacks are rich and deep and the range of gray tones is extensive. Bitrates are consistently high at 8 Mbps—which helps considerably. There are a few light jumps in the picture and one slightly jarring splice, but by and large this is a very satisfying viewing experience. Audio Transfer Review: The sound is in the original mono, played back in DD 2.0. Overall, it is quite adequate, if a little tinny and obviously dated. Though the soundtrack is not entirely clean, it is for the most part clear and crisp; there is only a faint, low crackle audible in the background. One needs to concentrate to hear the background noise. There are none of the loud cracks and pops usually associated with films of this vintage. Extras Review: There are several very interesting extras included in this release. The best of them is a 12-minute featurette that largely consists of interviews with Bob Baker, who at age 19 was in charge of the puppets for the film, and with Ulmer's widow. Baker's interview is unfortunately marred by the noise of several dogs barking throughout it. He still has the original puppets, and displays them, as well as some color 16mm film that he had shot of the puppet show scenes being filmed. This 16mm footage is in quite nice shape, and retains good color. Ulmer's widow gives some interesting tidbits about Ulmer and his fascination with the story. She also gives credit to the photographer, Eugene Schufftan, who was listed only in overseas prints due to Hollywood infighting. I truly wished that there were more to this featurette, which seems all too brief. The disc also contains a wide variety of publicity materials, including lobby cards, posters, still and excerpts from the pressbook for the film. I found that the instructions for this section were incorrect: the chapter key, not the step key, controls the movement there. Most of these materials were also in an admirable state of preservation; the lobby cards in particular had held their color well. There is an 8-page pamphlet that reprints additional pressbook materials, which make interesting reading for background on how such a film might have been sold to the public in 1944. It describes things like hiring someone to walk around town looking sinister in a blue beard, and how they put on puppet shows with the Bluebeard theme. While the material that is provided is excellent, I was definitely left wishing that there had been more—a trailer would have been nice. All Day could also have added a few more chapter stops, since the chapters tend to run a bit long if you're looking for a particular sequence. All Day Entertainment has done a very solid job of presenting this seldom-seen film in near top-notch form. In all, a pleasure for devotees of classic horror films.